The magician asks a spectator to select a card, and then shows a prediction. Unfortunately the prediction is completely wrong! 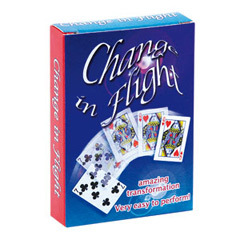 But after having asked the spectator which card he had chosen, the magician tosses the wrong prediction in the air where it suddenly and visibly changes into the spectator’s selection. The deck is not supplied.